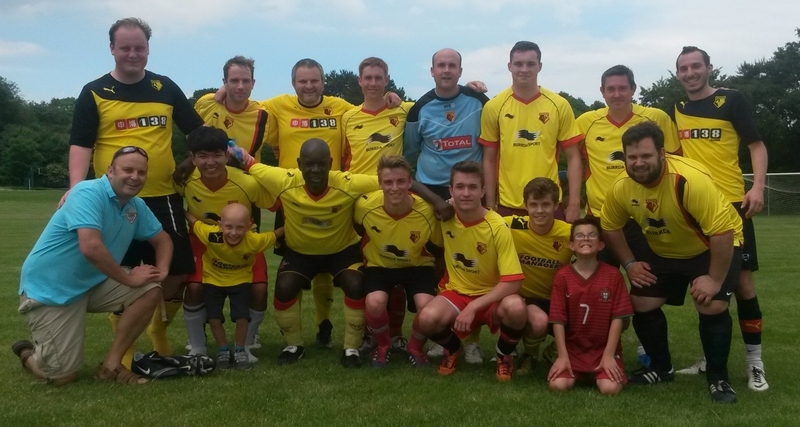 WIFC closed off their IFA league season with a hard-working 3-1 win at Stevenage this weekend. 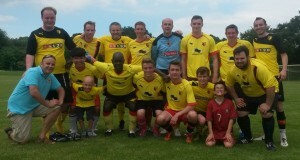 It was the first league win WIFC have recorded against their Hertfordshire neighbours, the only other win coming in last season’s London Cup Final. Richard Murphy beats a Stevenage player, watched by old-timer Paul Watt. The Internet ‘Orns raced out of the blocks, and centre-half turned striker for the day Ally Hill bundled in his 9th goal of the season from close range after good work from Paul Watt after just 5 minutes. With some good lively forward play, WIFC continued to create chances with Ross Connor and Stuart Holdham both going close to double the lead. Stevenage always threatened at the other end though, and got an equaliser through an unfortunate Ben Morrison own goal. WIFC restored their lead shortly before the break when a through ball from player-manager Richard Walker was finished well by leading scorer Jimmy Davis. After the break, the lead was extended when Mike De-Crescenzo slotted home his first goal for the club, while Davis could and should have extended the lead and Ross Connor hit the bar. Chances came at the other end too, but a mixture of good saves from Tom Beck, resolute defending from the whole team combined with WIFC’s better finishing led to a deserved third win on the bounce to close the campaign. A cobbled together WIFC side traveled down to Southampton yesterday and came away with the spoils, after a hard-working and committed display saw the Internet ‘Orns run out 6-0 winners. The current focus on getting to 20 games for the tenth season in a row was of paramount importance, and a week of hard work from Dave Messenger and Pete Fincham scraped together 14 players from various sources, with the result and performance being the icing on the cake. Despite having a bare XI at KO thanks to traffic issues, WIFC raced out of the traps. Korean loanee Roy opened the scoring to his obvious delight, as the English student who is taught by Pete’s better half took control of a loose ball on the edge of the area and smashed it home. The lead was doubled within 5 minutes, as leading scorer Jimmy Davis went to double figures for the season when he finished coolly. The lead could and should have been extended when a great Davis cross picked out Pompey IFC loanee Daz Lambe, whose bullet header was controversially ruled out for offside, though it appeared Davis had pulled his cross back. The second half saw WIFC continue to play some great football going forward, while a resolute defensive performance from skipper for the day Brad Simmons, Ben Morrison, Matt Ball, debutant Michael De Crescenzo, and Dan Norris (Jimmy’s mate) kept the Saints at bay. Lambe got his name on the scoresheet when he tapped home a goal-bound Davis cross, and Ross Connor, also making his debut, stroked home the 4th from the edge of the box. Davis added number 5 when he shot through the keeper’s legs, and Connor completed the scoring with another neat strike from the edge of the box. The allsorts celebrate a hard earned with after the game. Team; Dan Norris; Dave Messenger, Ben Morrison, Matt Ball, Brad Simmons; Roy, Dan Maher, Moz Clarke, Lozza Wells; Jimmy Davis, Daz Lambe. Subs Richard Murphy, Micheal De Crescenzo, Ross Connor. WIFC’s new management team finally got their first win since taking over from Chris Davis this weekend, as the Internet ‘Orns overcame Gillingham at a soggy Parmiters School. With the words of assistant manager Maurice Clarke ringing in their ears, encouraging the team to take more shots, a chance packed match could have seen even more goals for the home side. Centre half Ally Hill started the scoring when he tapped home a Mark Brennan cross, and he doubled the lead when rising highest to head home a Richard Murphy corner. Dave Soloway and Murphy both missed great chances, before Joel Moody added a third with a powerful strike from the edge of the area, and Gills reduced the arrears just before the break. It was the visitors who got the first goal after the restart to pull within 1, but the reaction from WIFC was exactly as you would hope, and when a visiting defender handled a Moody cross, Hill stepped up to rifle home the resulting penalty for a hat-trick and 8th of the season, a great return from centre half. Stand-in keeper Leigh Harrington then showed his form with a stunning stop to protect the two goal advantage, and shortly afterwards Chris Dew capped a man of the match display in central midfield by rifling home from close range after a half cleared cross. Soloway, Brennan and Matt Ainsley all then missed great chances to extend the lead, but job done and a fine win. Team. 4-4-2, R to L. Leigh Harrington; Ed Sterry, Ally Hill, Julian Carrera, Paul Labbett; Richard Murphy, Chris Dew, Stuart Holdham, Andy Myall; Dave Soloway, Mark Brennan. Subs Joel Moody, Ben Morrison, Paul Watt, James Jenkins, Matt Ainsley.